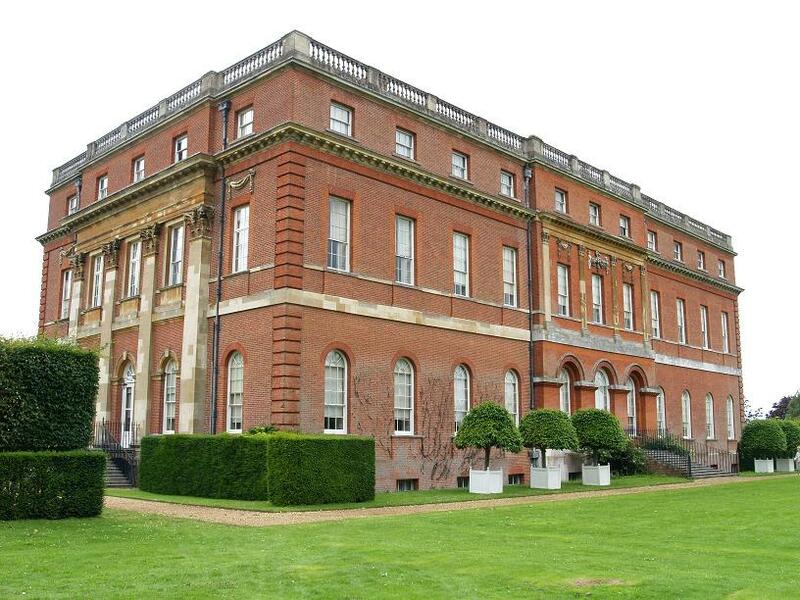 This page lists Go artefacts in Britain, for example exhibits in museums and stately homes. It includes paintings, furniture, porcelain and of course Go equipment. If you discover something not listed then let us know and include any photographs or web links. A list of Japanese collections in British museums is held at the Japanese Embassy site . Note: museums usually have large collections that are not permanently on display and items are often rotated, so there is no guarantee to see anything listed below. 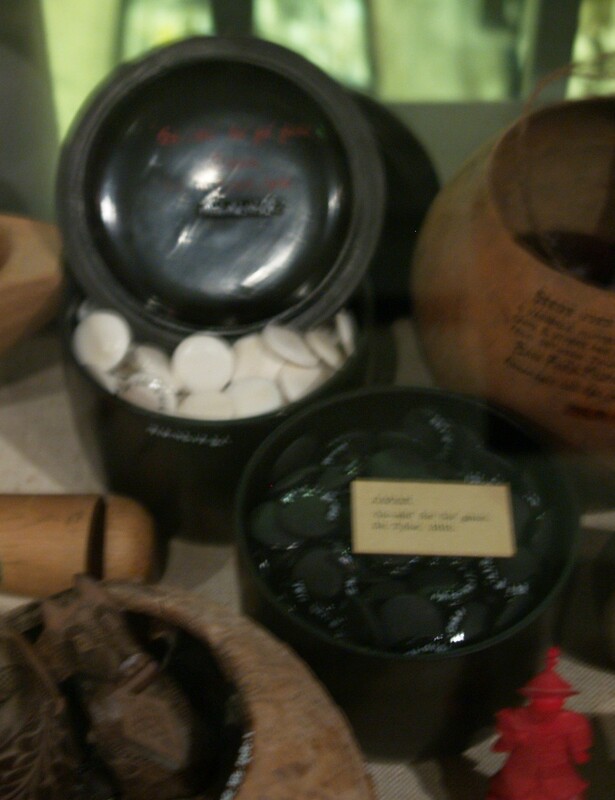 If you want a quick look at items displayed have a look at photos of artefacts . On level 2, in the Korea room, is an exhibit captioned “wooden paduk board and pieces made of shell and stone”, which is an interesting Korean board, specifically an 18th–19th Century Sunjang Baduk board, hollow with tensioning wires underneath to make it resonate when played on. There are bowls and slate and shell stones of similar age . Sensei’s Library has an article about Sunjang Baduk . There is in their collection a 19th Century Japanese Go ban, with gold on black floral decoration around the sides, and matching bowls. 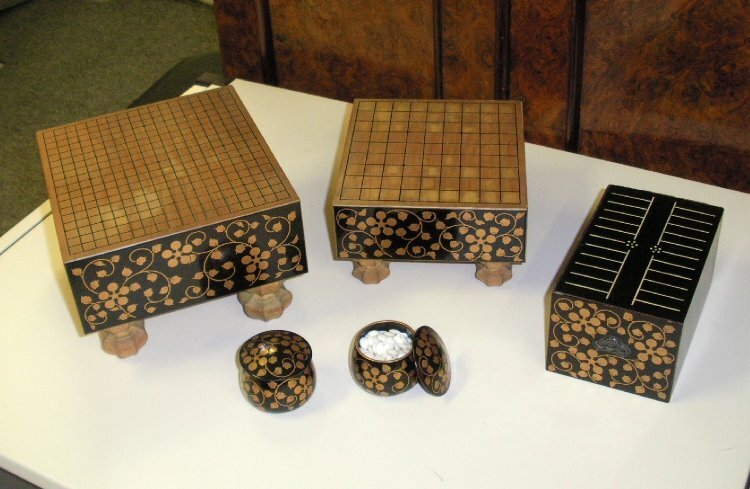 It is part of a set with a Shogi board and Sugoroku (backgammon) board decorated the same way. 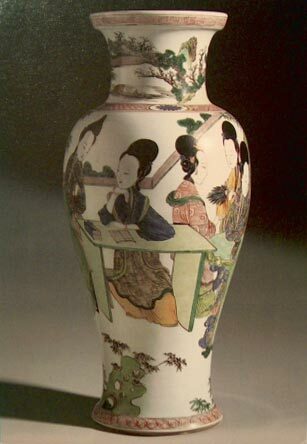 In the Chinese collection is a Cizhou-type Ming stoneware vase from the 15th Century. It is about 30 cm high and is decorated in black enamels under a turquoise glaze. It shows the immortals at pursuits such as music (on back) and Go (two men play as a third watches). 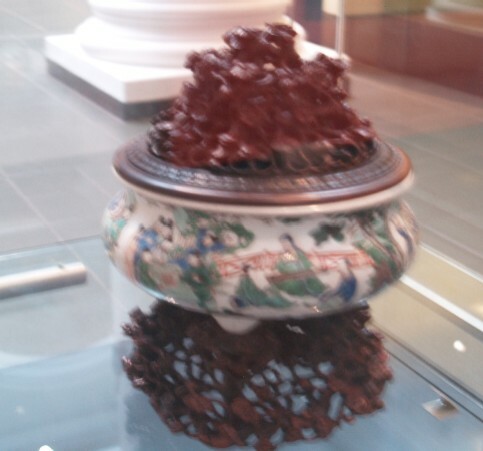 A larger vase features Chinese Chess. Neither were on display in Autumn 2011. There is a large collection of Japanese netsuke (mostly not on display), seven featuring Go. Four of them are carved in the shape of hollow fruit (such as a peach, orange or persimmon), with two or more figures grouped around a Go ban inside. 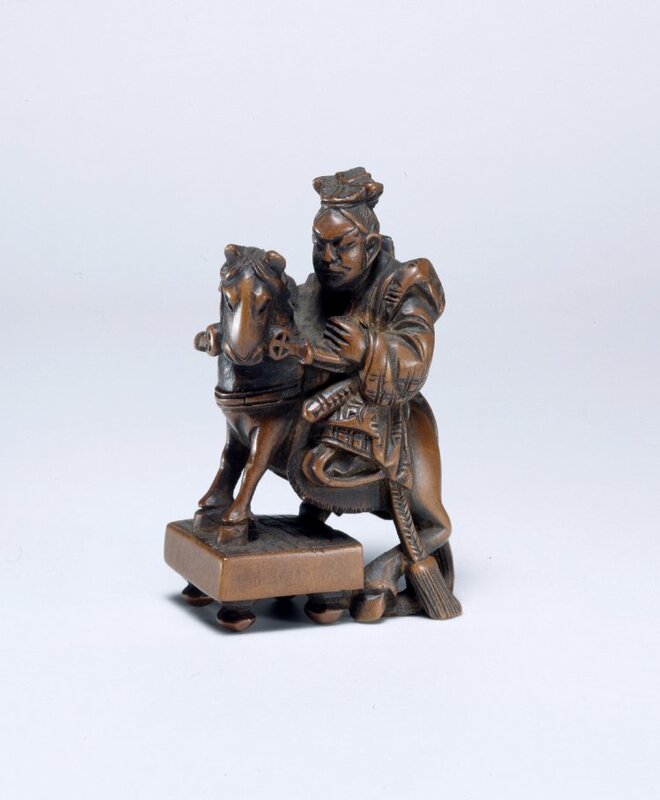 Another is just a carving of men playing Go, whilst two are carvings of the famous horse and rider on Go ban (as in the picture). 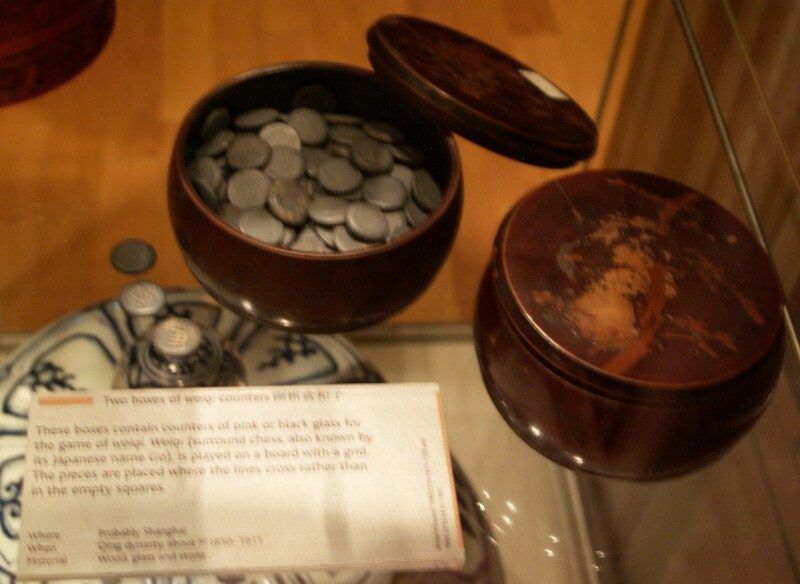 The games collection has a 19th Century set of stones from Shanghai. The stones are small (about 1 cm diameter) and have Chinese characters on their face. They are contained in brown wooden bowls with patterned lids. These stones also formed part of the "China: Journey to the East" exhibition that visited Bristol Museum in early 2009. Also in the collection are two tsuba (Japanese sword guards); one shows Tadonobu hurling a Go board and the other sages reading and playing Go. There is also a small (12 cm) wood block print by Keisei Eisen, c 1820, showing two lovers on a Go board. Other objects are in the games collection, part of which toured the UK in 2005-2007 as the Across the Board exhibition. In the British Library collection from Dunhuang in China is a 6th century Go manual . It is sponsored by Peter and Sheila Wendes (Zenmachine). 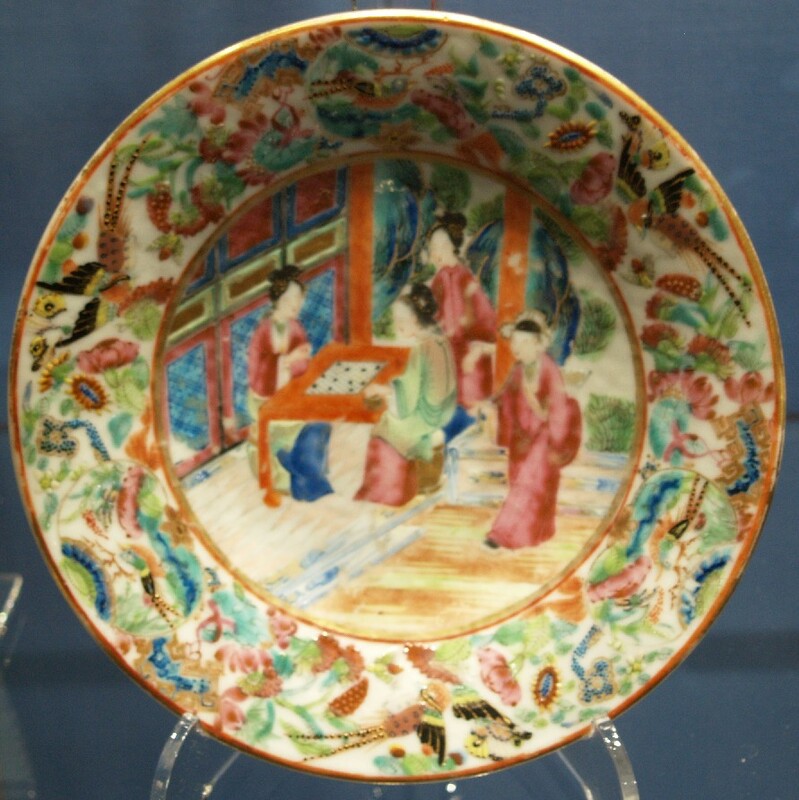 The Percival David Foundation of Chinese Art is a large collection of Chinese porcelain that was part of SOAS. It was on display in its own museum until it closed at the end of 2007. The collection has been transferred to the British Museum's Gallery 95. 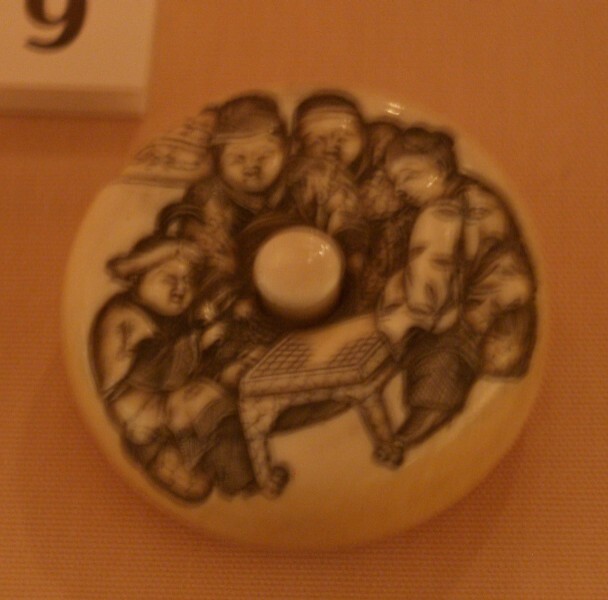 In the collection there is a Ming jar dated 1543 featuring Go players. 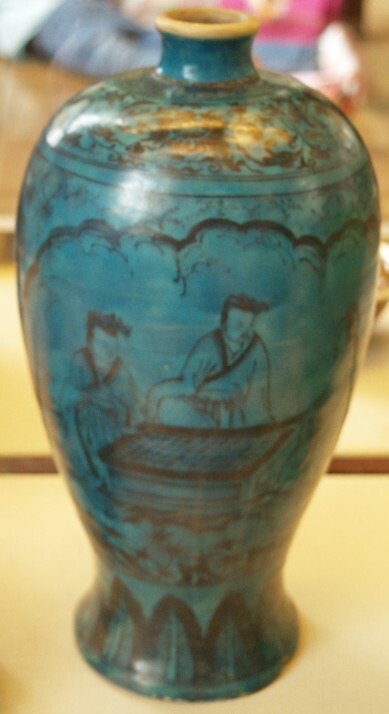 The jar is 13.5 cm in diameter with blue underglaze decoration. 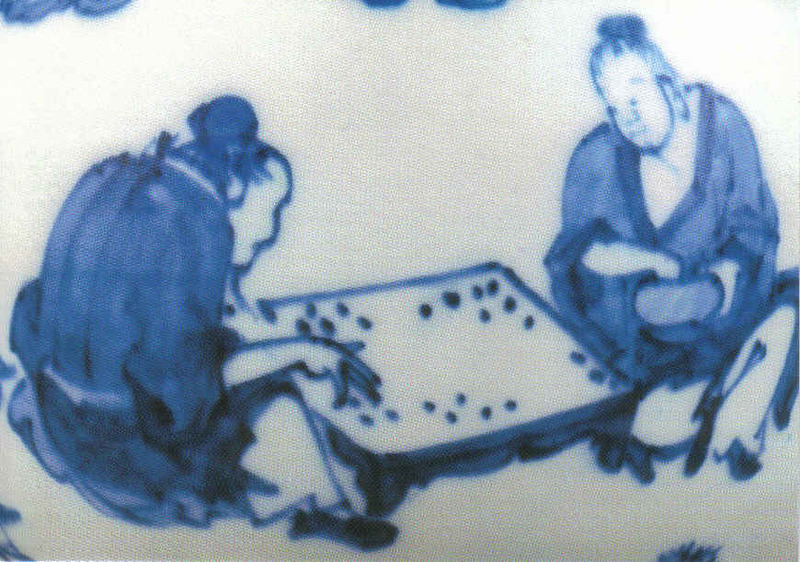 Two players crouch at a board, one holding his bowl and the other playing a stone on the board which has no grid visible, but decorated sides and legs. Photo . The image featured on a greeting card . 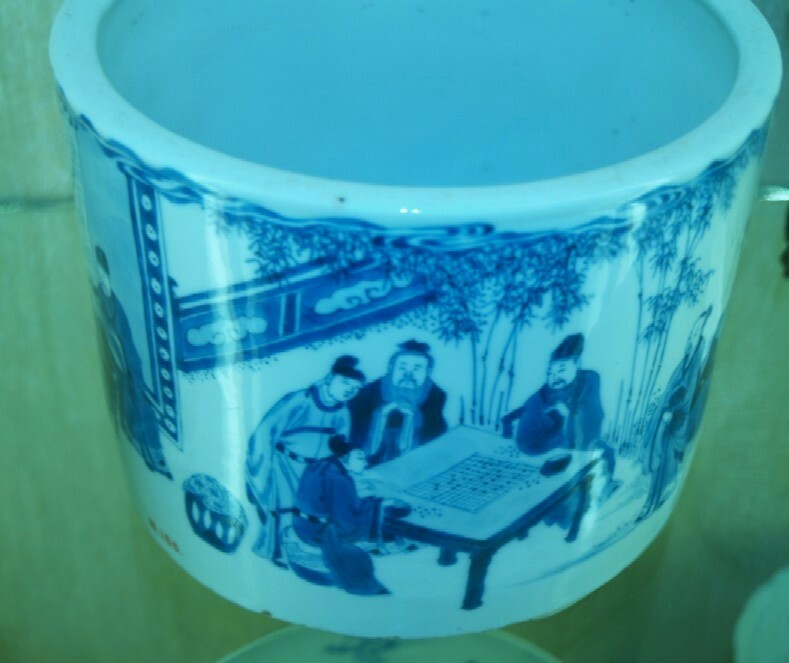 In case 23 item C606 is a larger 25 cm jar or vase featuring games, such as Bilnd Man's Bluff, but probably shows five people grouped around a Chinese Chess board, not Go. 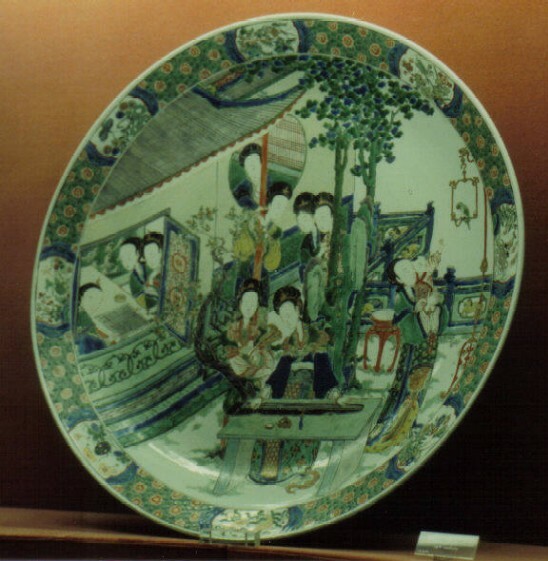 In case 21 item B629 is a 25 cm bowl featuring ladies in a garden under the rim. 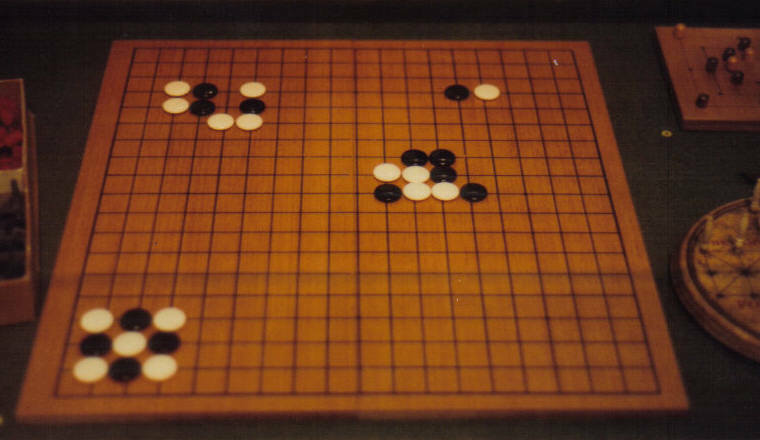 Two of them sit at a medium-sized Go board. 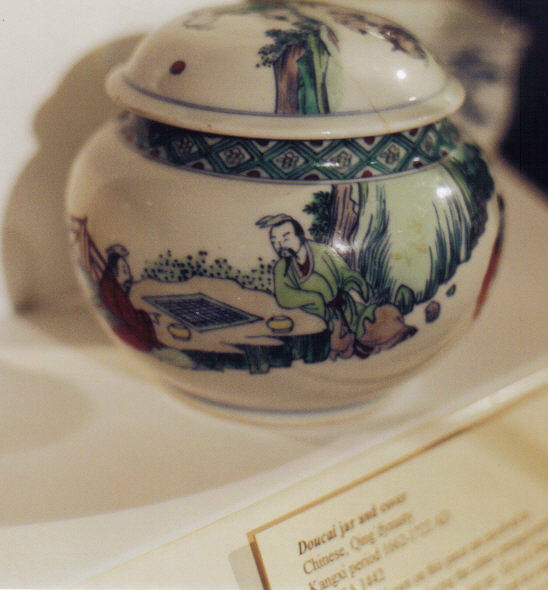 In the new porcelain galleries opened in 2009 (on level 6) there are many items depicting Go, mostly made in the 1662 to 1722 period in Jingdezhen, the centre of Chinese porcelain manufacture. More details on the porcelain galleries collection . This museum was extensively rebuilt and fully reopened in November 2009. It has various objects in the East Asian Art collection. 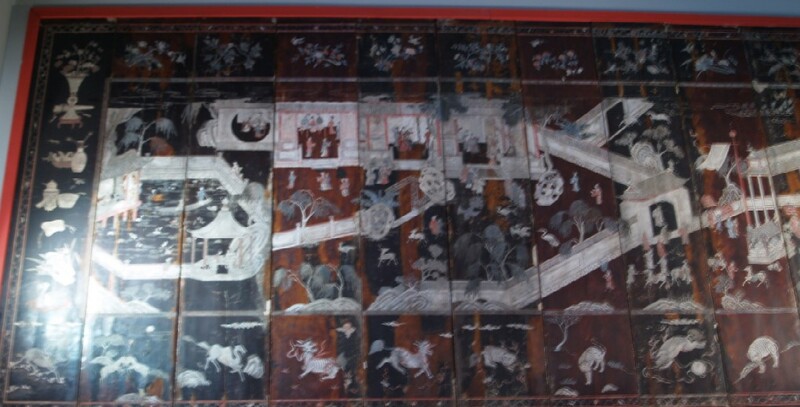 Coromandel Screen: a huge 12-panel 10 foot high wooden screen from Chinese Kangxi Period (1662–1722). 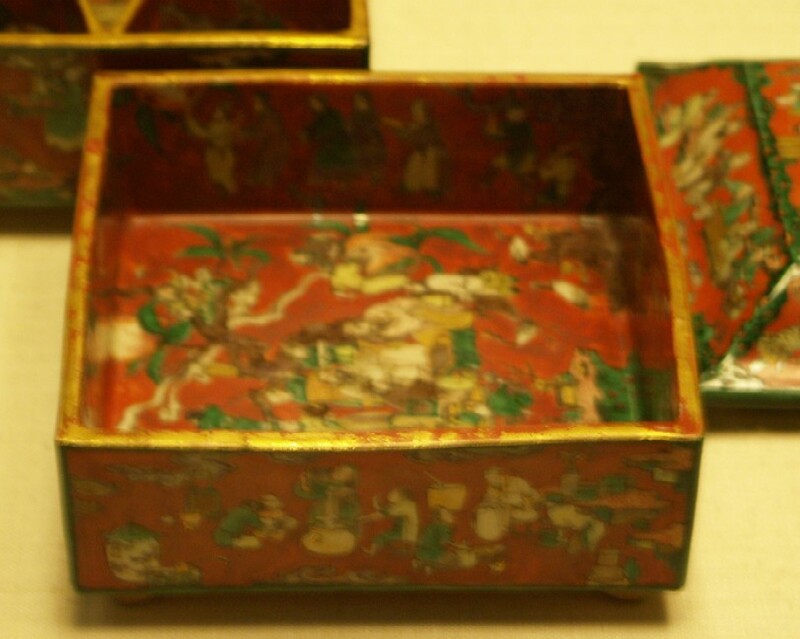 It is gilded and coloured (painted and incised lacquer) with many scenes of dancing, soldiers, trees and buildings. 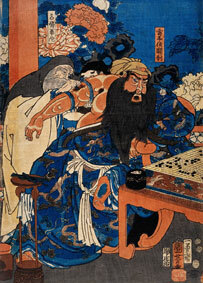 On panel 9, in one building three old men are gathered round a Go board. The one in red points smugly at the board. Currently in Gallery 35 West Meets East. 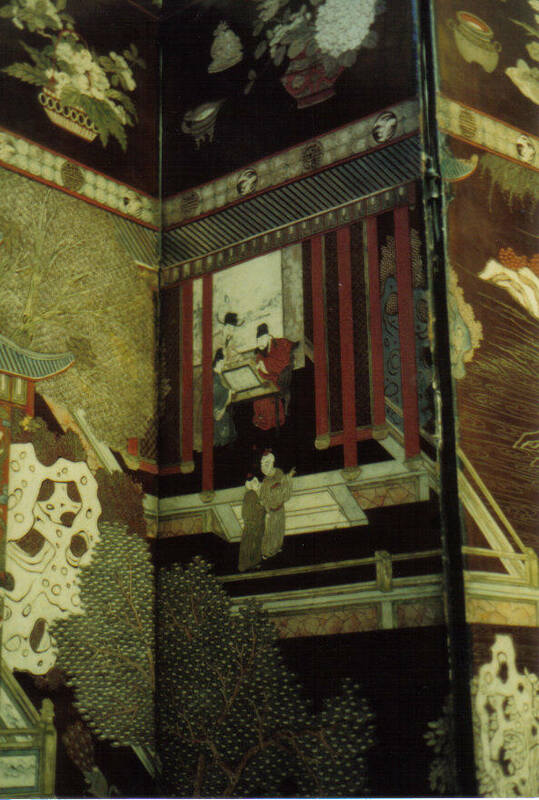 A black lacquered display case with decorated panels at the base. One is a Go scene with two Chinese men playing Go by some rocks and trees. A third man watches as the man in orange leans over to play the first move. Currently in Gallery 35 West Meets East. 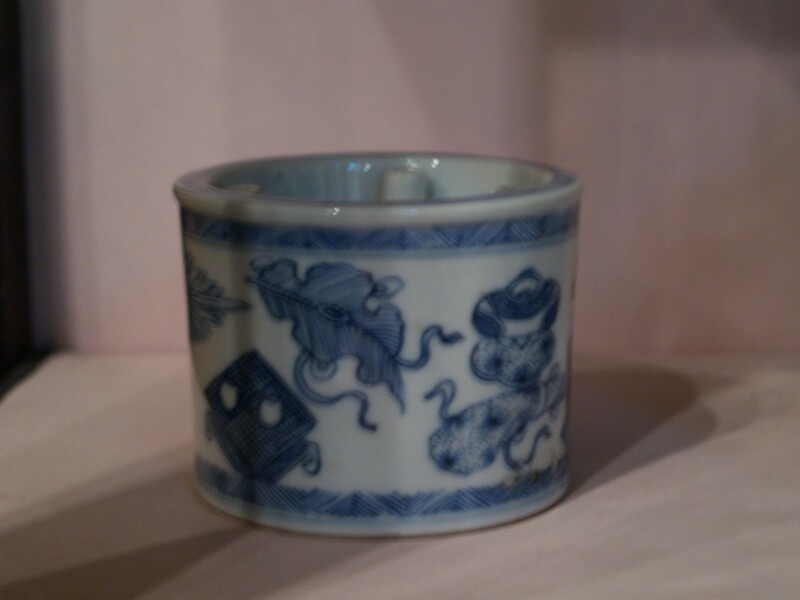 A Chinese plant holder in censer form with underglaze blue decoration, dated 1755 (Qianlong style). Shows a board on a fancy table with five large black stones placed as a handicap. Not on display. Porcelain Stand: Chinese Kangxi Period, famille verte colours on the biscuit. Shows the Seven Worthies of the Bamboo Grove at music, calligraphy and Go. Two men play whilst a third watches. Not on display. Large Dish: famille verte over glaze decoration. Shows ten ladies at pleasure: music, children and Go. 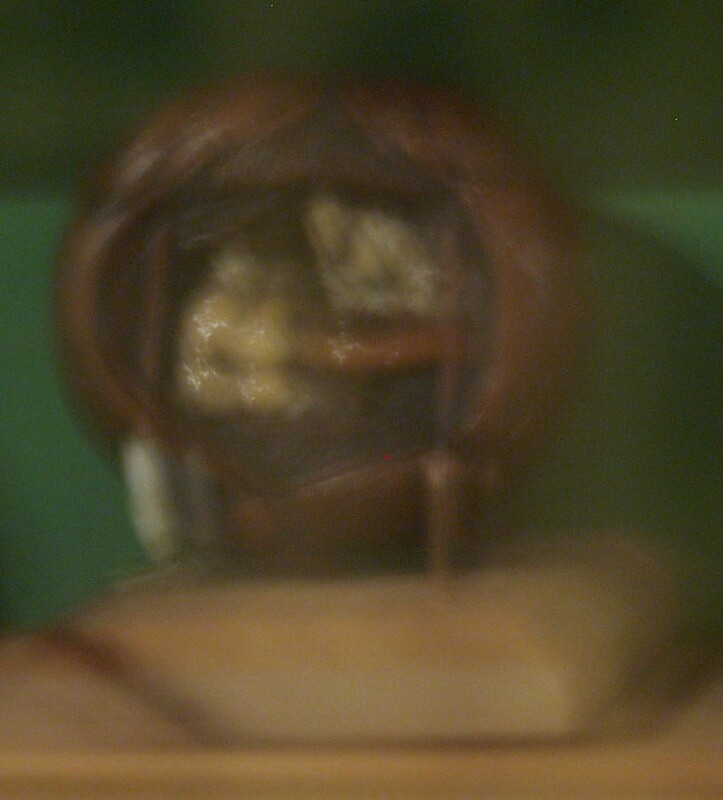 The game is watched, seen through an open window. Not on display. In Gallery 11 (Chinese painting): Drawing on ink on paper: attributed to Su Liupeng (1786-1862). Shows two men seated at a right angles, one on a boulder, with a paper board resting on a large boulder with tiny stones and low bowls. The caption does not mention Go, but one man is captioned a wood cutter. 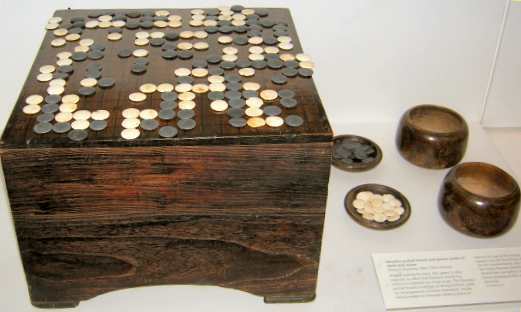 Has several cases of ancient games (dice, cards, Warri, and so on) on the south side of the Lower Gallery, which also houses a collection of some thousand netsuke (Japanese belt toggles). In case L90A, a pair of Japanese black lacquer Go bowls with saucer-shaped lids, added to the collection in 1910 by a Dr Taylor. 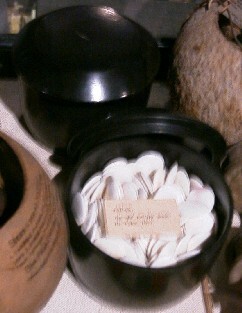 The white and black stones are displayed within and they are thin clam shell and slate, slightly smaller than normal; each stone has its catalogue number painted on. In case L89A, hand painted Hasami Shogi pieces collected in 1865. The game is described as Chess where you surround the enemy like simplified Go. There is also a set of normal Shogi pieces in case L90A. In case L95B, a netsuke of two men in a cave with a Go ban. 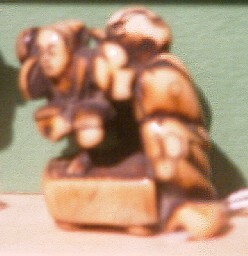 Sometimes in case L95C (but not on display May 2007), a netsuke of a monkey working a puppet on top of a Go ban. 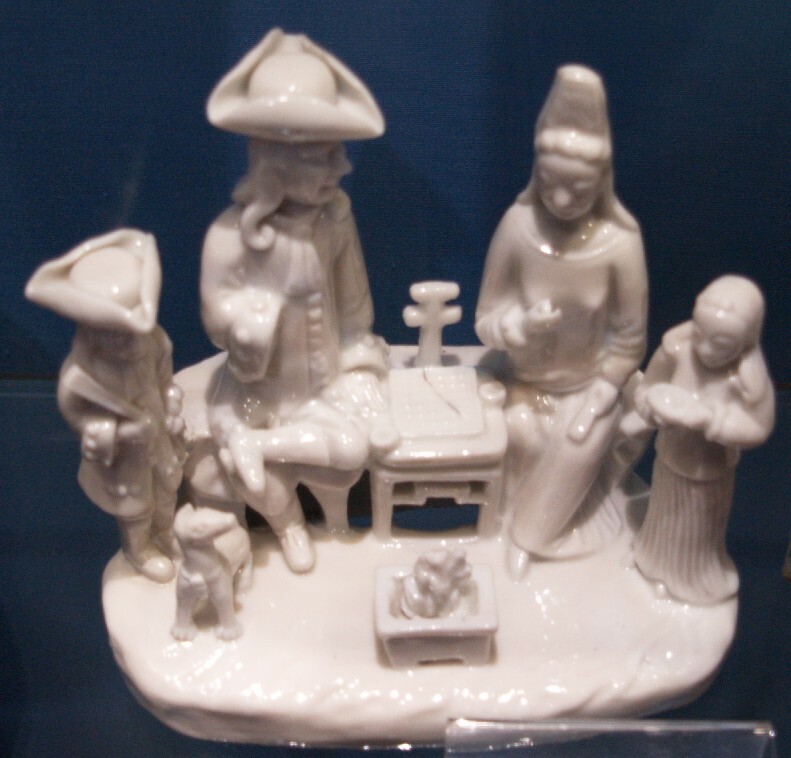 In Room 26, item JL.9 is a moulded white porcelain ink stand of a boy sitting on a Go board, Japanese c1680. 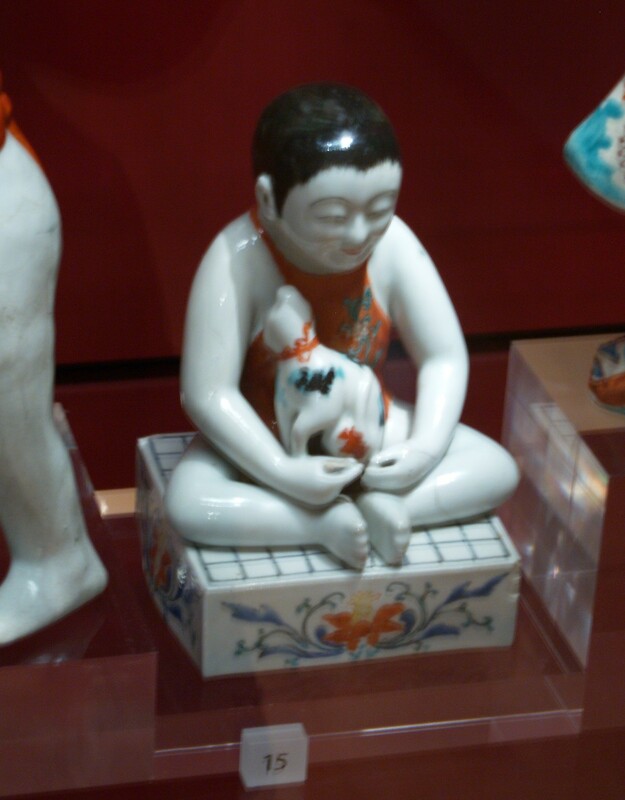 About 8 cm wide and 15 cm tall, a young boy in red leotard sits on a Go ban with feet together and knees akimbo. The board has flowers on the sides in enamel paint and blue grid lines (11x11) and typical Go ban feet. Also in room 2, item O.1938 is the left hand of a pair of painted glass mirrors, 60 cm by 90 cm, in gilt frames. It shows a couple seated at a table in open buildings by some water. They wear long coloured robes and hats in the Chinese style. The man rattles his stones in a brown bowl, while the lady holds a white stone correctly in her fingers. The grey board is depicted long and thin however. The mirror is mid-18th century. In room 28, item C10-1978 may show a representation of a Go board. 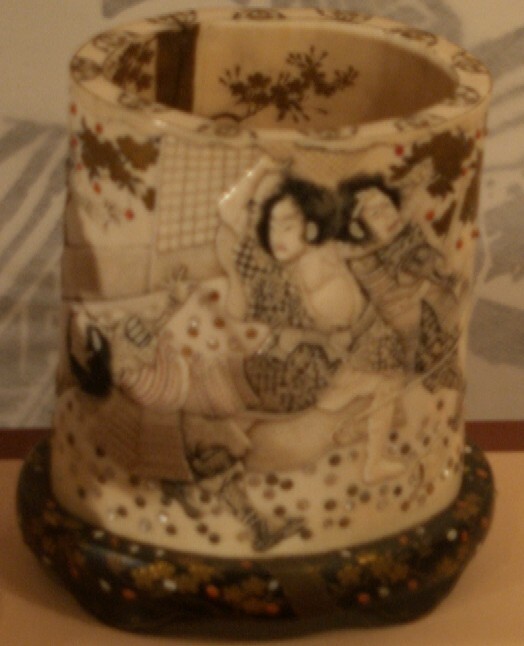 A Ming double walled hot water bottle of c1500 shows on its inside surface five figures, two of whom are by a grid with blobs on. The perspective is wrong though and it could represent some sort of net in a frame. The bottle is 10cm in diameter and porcelain with blue painted underglaze. In the Sasakawa Fan Galley, a Chinese Brisé fan (hu shan) from about 1820-1840 has lacquered wood sticks. Part of the scene on one side shows two women seated on a bench and red chair playing Go on a red table. One holds out her hand to play a stone. 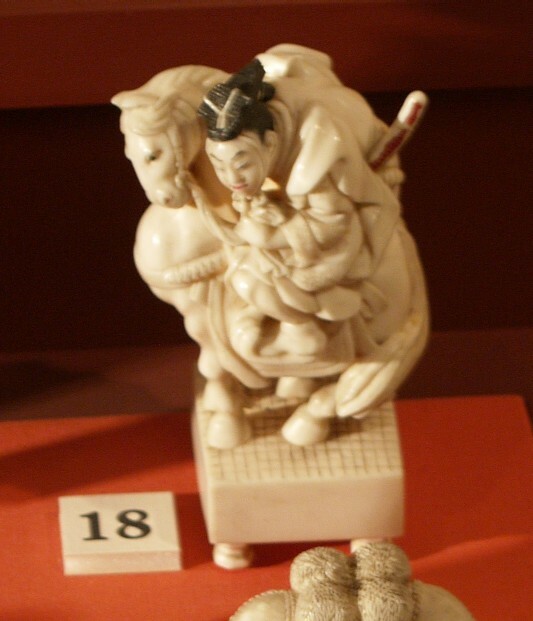 Also in their collection are two Go netsuke; one is carved with Go players and the other is of a horse being ridden on to a Go ban. In addition they have two Japanese woodblock prints; one by Yashima Gakutei shows Go, from a series on the four accomplishments, and the other is Tadanobu defending himself with a Go ban. Displays the Walter Samuel Collection of Japanese art and also Julius Brenchley's Cabinet of Curiosities both of which feature Go-related items. In the Japanese Gallery (room 10) in the People, Legends and Gods case, item 18 is an 8cm tall 19th century ivory figurine of a man, Oguri Hangan, riding the tamed man-eating horse “onikage” balanced on a goban, by Hakuunsai. Item 11 is a large, 20 cm tall, oval pot (maybe a brush holder) of elephant ivory on a decorated wood base from 1860s. It shows a samurai fighting assailants, hitting one with a goban held over his head, the coloured Go stones spilling everywhere and the bowls kicked over. 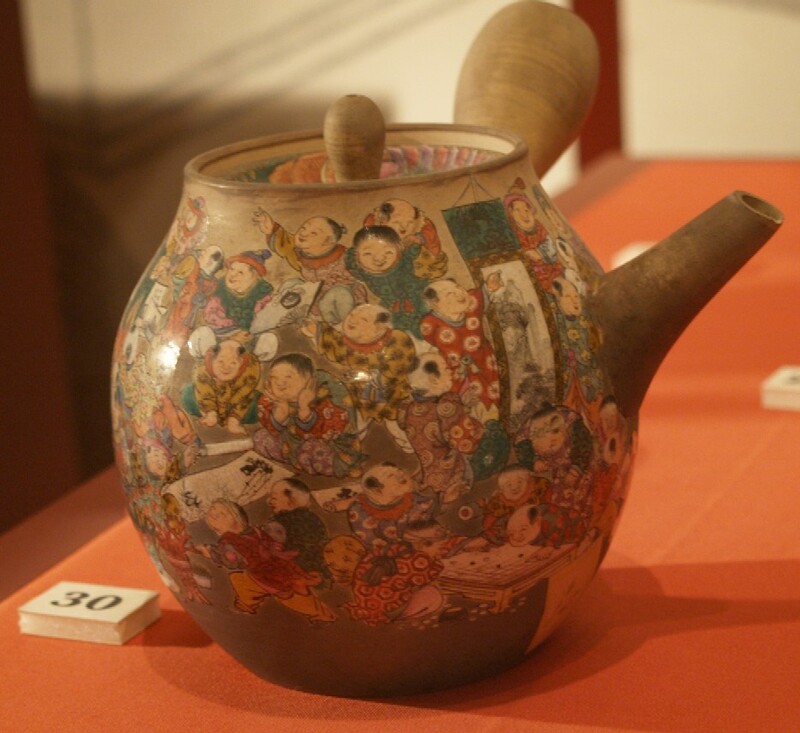 Item 30 is an unglazed ceramic enameled tea-pot, 8cm big with side handle and spout, by Kentei c1800. A large group of kids practise calligraphy and play Go; one is pointing at a move on the board. 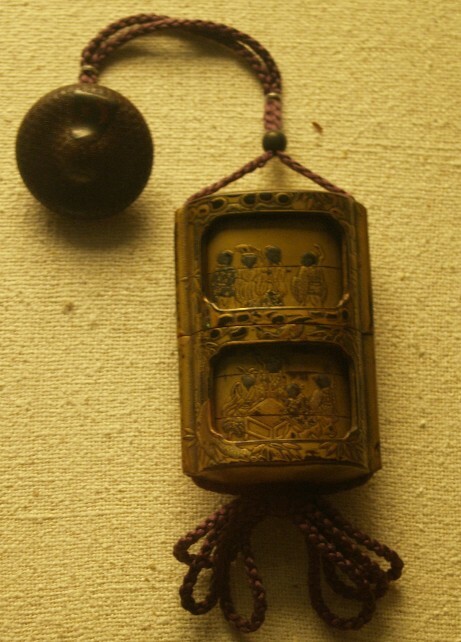 In the case of inro and netsuke, number 9 is a 3 cm white donut-shaped netsuke with stopper showing with four people and a goban on thin legs. 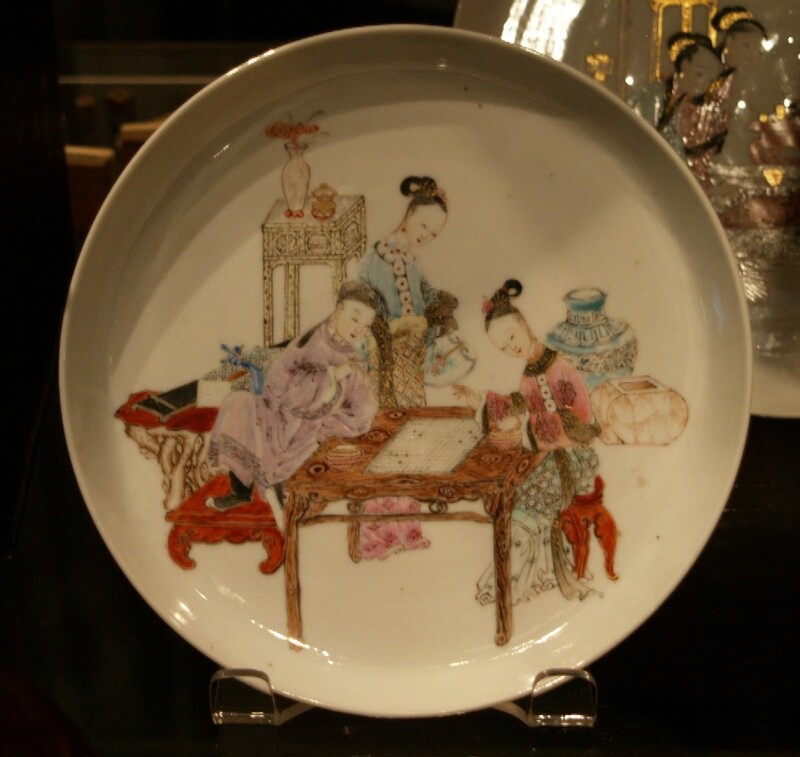 In the Cabinet of Curiosities in room 25, Chinese porcelain famille verte plate from 1720 showing ladies taking tea on a verandah about to play a game. 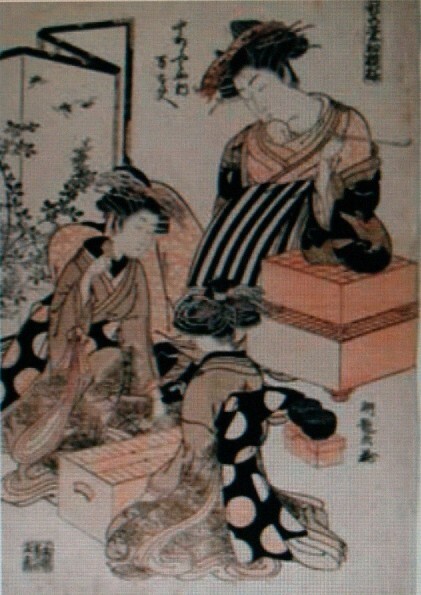 In their travelling exhibition of Japanese woodblock prints, an 18th century print by Isoda Koryusai described as "Courtesan with two kamuro". 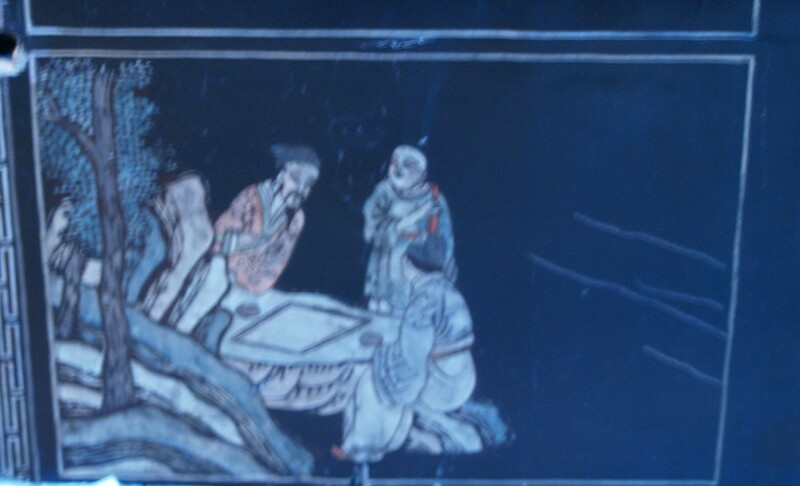 It is of two women playing Sugeroku (Backgammon), with a third leaning on a Shogi and Go ban. A copy can be bought via their web site (print number 424). Has a small Doucai jar and cover from China, Kangxi Period (1662–1722). It shows two men playing Go on a large tree stump. 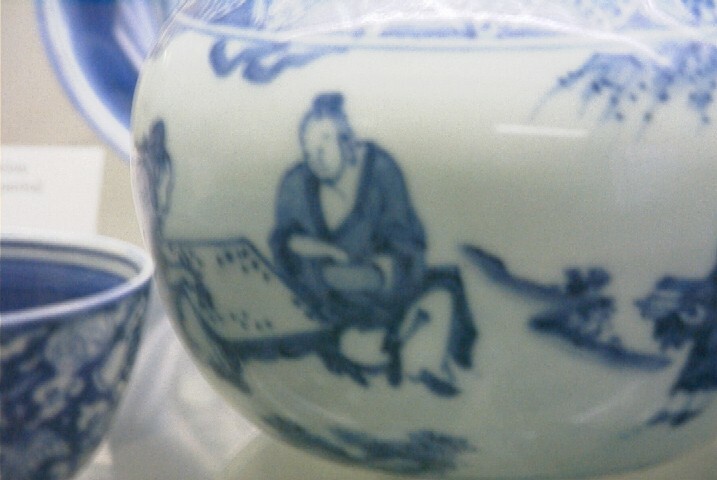 Also there is a blue and white Chinese porcelain jar, about 20cm diameter, from 1662-1722. There is a photograph of its reverse design which shows a "Chess board" on a table with spindly legs. This probably represents Go as there is no river visible and the vase depicts Buddhist cultural emblems, such as music and calligraphy. There is a golden and painted Chinese fan presented by the local Chinese Society. It is not fully unfolded, but appears to show a man standing in front of a Go board amongst the pictures of figures. 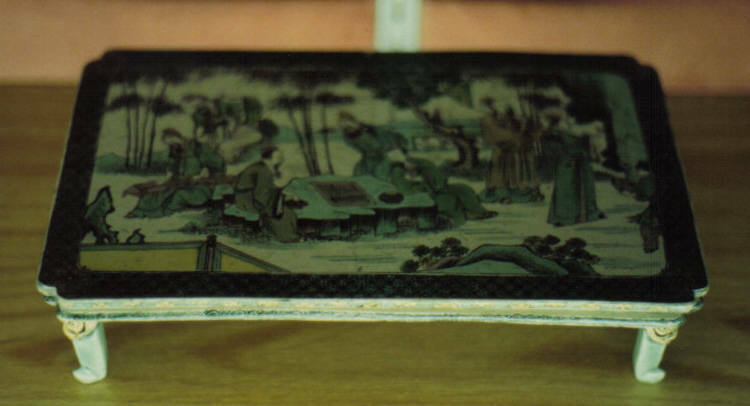 In the Games case on the ground (top) floor is a brightly decorated Chinese porcelain plate. 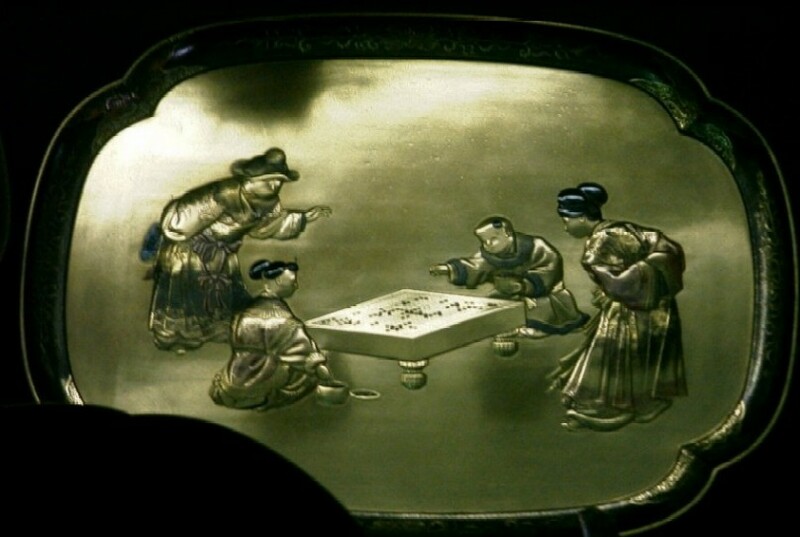 It is about 5 inches diameter and shows ladies playing Go. Two sit at a table on a veranda and play, while two more stand and watch. The caption explains the ladies are "playing Wei Qi (also known as Go)" and states "It is considered by many games experts to (be) the most complex strategy game in the world, far more complex than Chess." Contains the collections of Denys Bower. The star of the Japanese collection is the Beckford Casket, 1635-1640. 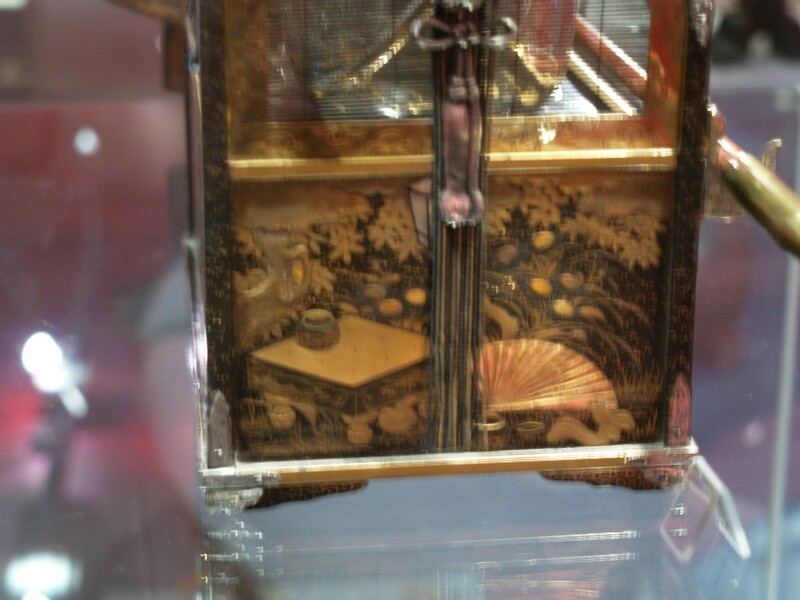 It is about 40 cm square, and the same high, and is decorated with lacquer and gilt. 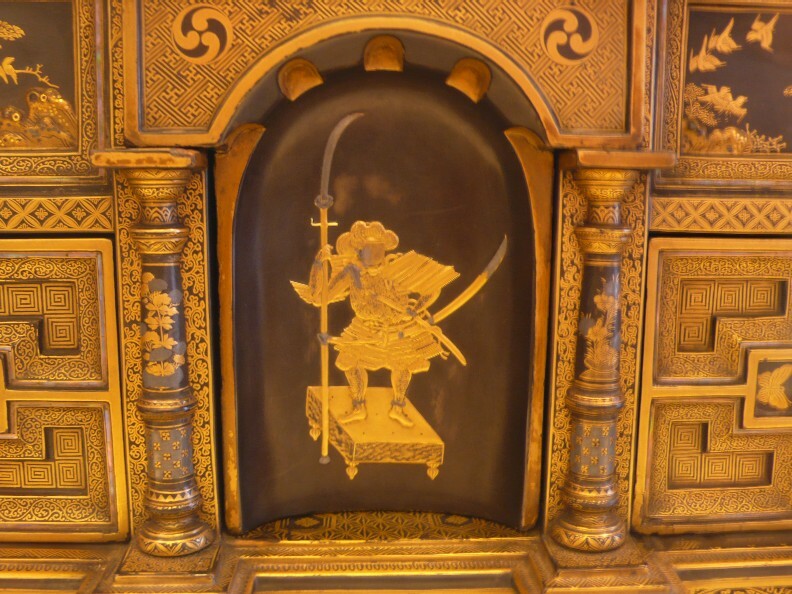 The arched panel on the front contains a relief of a samurai, with a stave (noginata) and two swords, standing on a decorated goban. The goban has decorated faces and legs, and has the handicap dots visible. 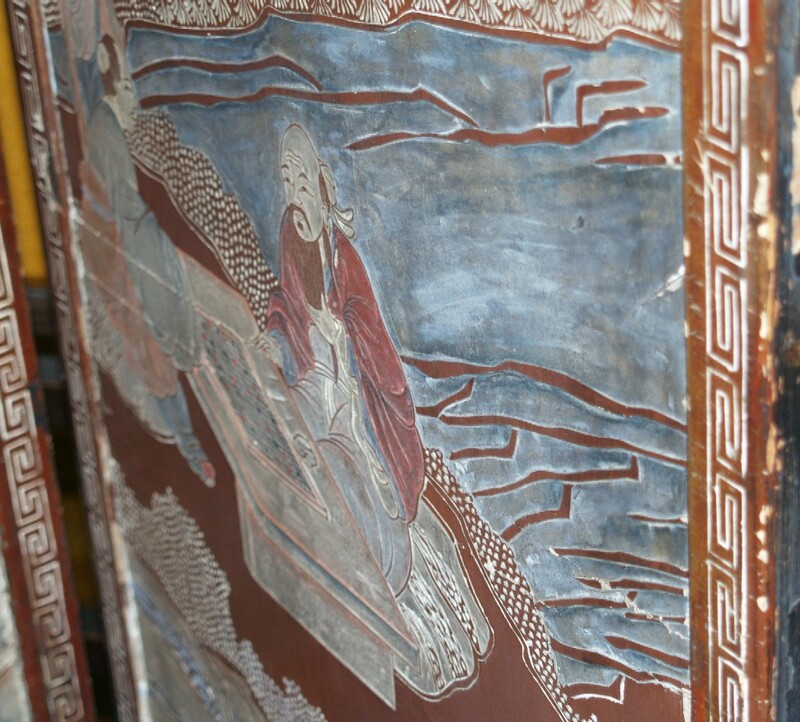 In the Hunting Room on the ground floor was a 17th century Chinese coromandel cabinet. It has brass hinges and handles and rests on a large metal stand. It is decorated with figures, including children at play and various adults at pursuits such as music and caligraphy. On the right hand door, two women are playing Go, whilst a third stands and watches. They play on a white board, resting on a wooden table on a veranda. One has a fan and they have elegantly decorated costumes. It is not known if it survived the devastating fire of 29th April 2015. 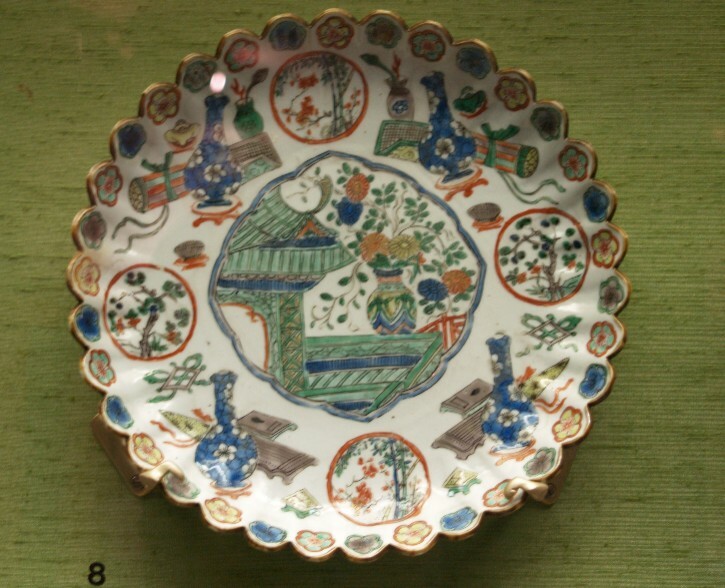 This house dating from the 16th Century has two porcelain objects featuring Go. 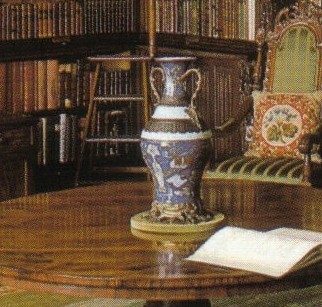 In 2007, on the circular table in the library is a large 19th Century Chinese vase. It has ormolu handles and base, is about 70 cm tall and has a background of cobalt blue. It is decorated with fish, vases and other objects, including a flat gray Go board with two brown bowls. 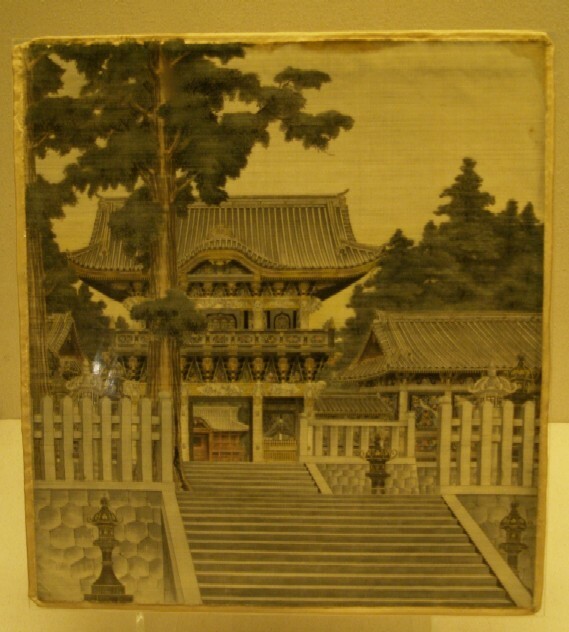 On the mantelpiece in the gallery bedroom is a small rectangular Chinese porcelain dish and lid, about 10 by 7 cm. 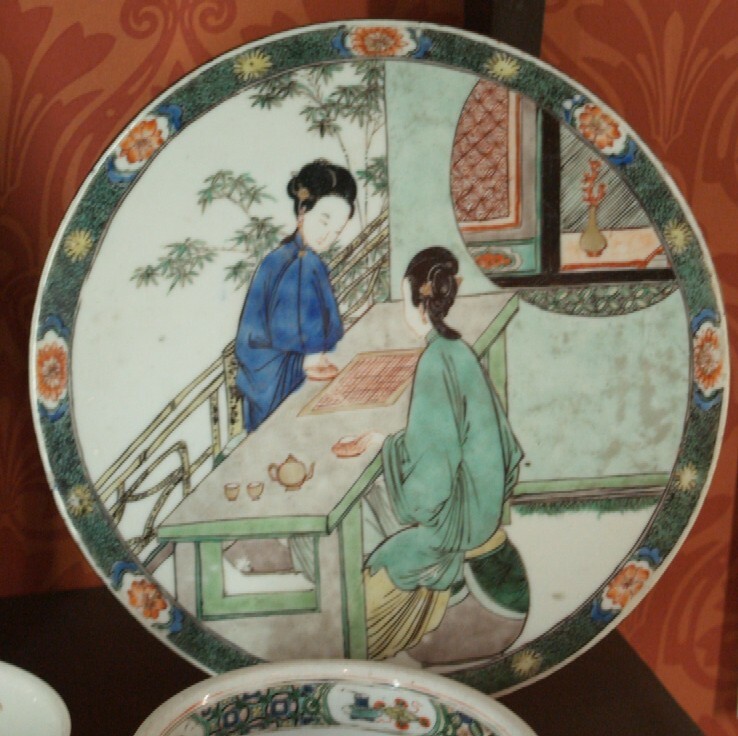 On the lid, two ladies sit at a red table and play on a flat grey Go board, with one brown bowl visible. Other people stand nearby. This house is delightfully situated in the Salisbury Cathedral Close. 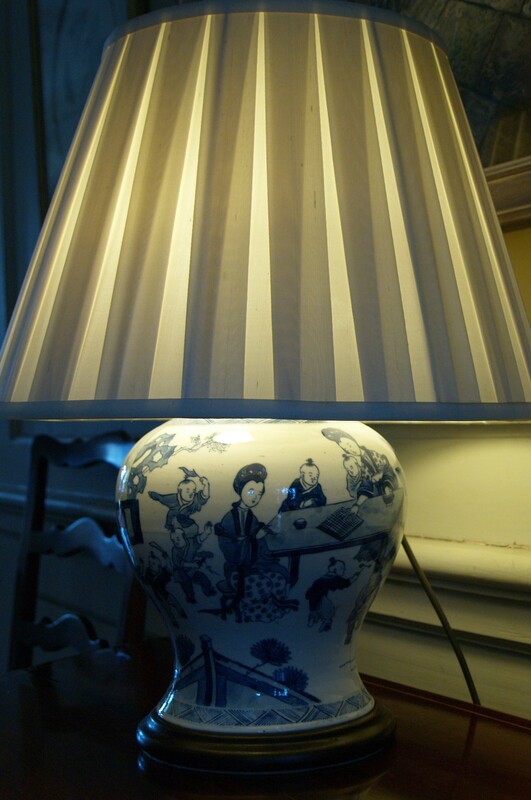 On a table in the passage to the rear of the entrance hall is a 19th Century Chinese vase in use as a table lamp. It is 10 inches tall with blue on white glaze. Two women play Go with the board on a long table. 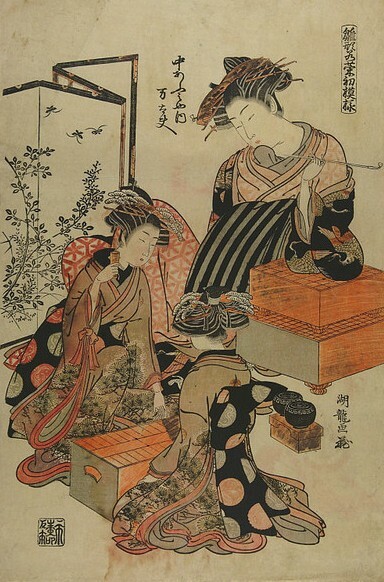 One sits on a stool and the other stands with her right hand playing a stone and her left hand in her bowl. Four children are at play by the table. Believed to have a vase depicting Go in Japan. This was hard to see in 2005, assumed to be the large vase on the floor on the far side of the dimly lit side room to the council chamber. Abbotsford, near Tweedbank in the south of Scotland, is the early 19th Century home of Sir Walter Scott. There is a very significant item which virtually proves that Scott knew about Go. 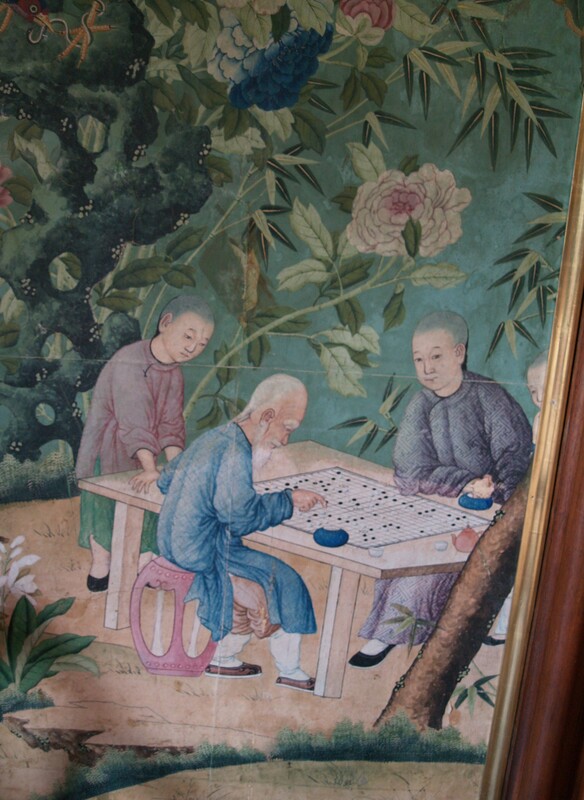 The Chinese Drawing Room is decorated with hand-painted Chinese wallpaper, a gift from his cousin Hugh Scott of the British East India Company. The design is trees full of birds, on a bluish-green background, with scenes of Chinese people engaged in various pursuits at the bottom. To the left of the door to the library, there is a game of Go prominently featured. There are two seated players at a table with a large white flat board on it. Their Go bowls are clearly visible and they have tea cups. The old man on a pink stool in front points with his finger. A third man is watching from the left and a fourth head peers around a tree to the right. The board looks too big but actually does have 19 lines each way. The handicap points are marked with four L-shapes, but are the five-five points; there are lots of moves played but it does not appear to be a real game position. The V & A Museum of Childhood , Bethnal Green, London, put on an exhibition on the history of board games between 8th October 2016 and 23rd April 2017 called "Game Plan: Board Games Rediscovered". It of course featured Go. From 18th September 2014 to 5th January 2015, an exhibition was held at the British Museum . It was called "Ming 50 Years That Changed China" and consisted of exhibits from the British Museum and items on loan from ten museums in China and elsewhere. All items date from the Ming dynasty years 1400 to 1450, a time of peace when the capital moved to Beijing. Some of the items displayed featured Go. From 12th November 2005 to 17th April 2006, an exhibition was held at the Royal Academy of Arts. It was called China: The Three Emperors 1662-1795 and consisted of exhibits from the Palace Museum, Beijing. 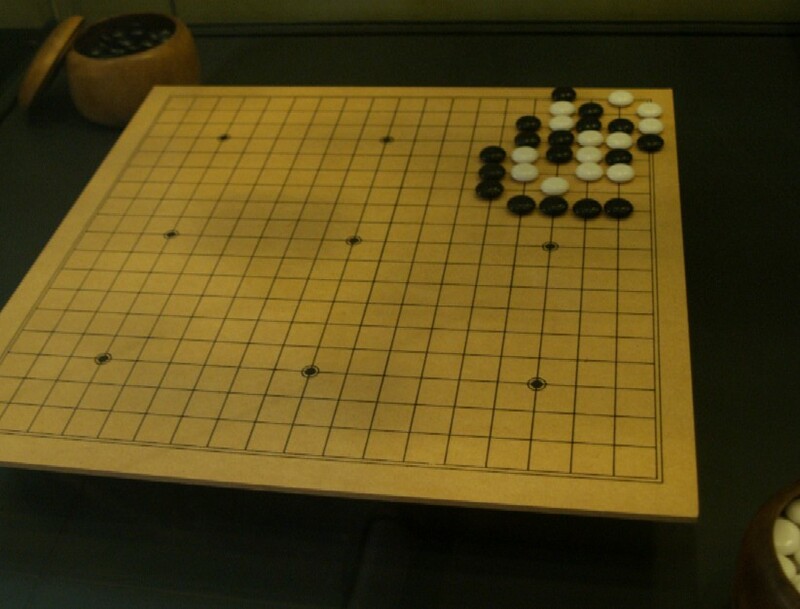 Several of the items displayed featured Go scenes. Various objects from the British Museum's games collection toured the UK in 2005-2007 as the Across the Board exhibition. It visited Segedunum Fort, Exeter, Gosport, Leicester, Lincoln and Luton. The Queen's Collection is known to feature Go-related prints and she was presented privately with a set of yunzi stones  in China a while ago (kept at Sandringham). In their Asian medical collection is a woodblock print by Kuniyoshi, 1853, showing Chinese surgeon Hua T'o operating the arm of wounded war hero Guan Yu, who plays Go to distract from the pain. This was used as the cover picture of Go World magazine issues 7 and 83. This and some of the collection was on display at the Brunei Gallery, SOAS, London from 13th October to 12th December 2004. Varous other museums have large oriental collections, for example, the Horniman Museum  in Dulwich, London SE23 3PQ, has a lot of Japanese items in its ethnic collection, but nothing Go-related is normally on view. Various toy museums around the country display old games, such as at Pollock's Toy Museum  in London and the Edinburgh Museum of Childhood , but Go is not normally featured.